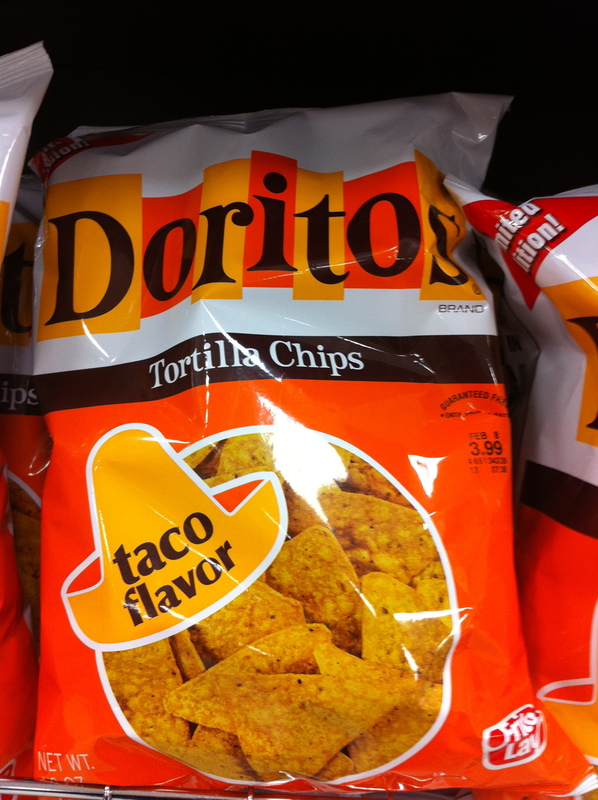 Old School Doritos… | DidjaEat? I don’t know why Doritos (or, The Frito Lay Company) decided to put out their old style bag (altho it does seem to be a trend. I’ve seen soda and cereal and all sorts of things using old packaging. I dig it. ), but it caught me by surprise. When I was a little kid, my parents didn’t buy any junk food really. My dad would buy a big bag of Pathmark brand rippled potato chips sometimes. He would keep them on top of the fridge so if I wanted to get them, I had to drag the chair to the counter, climb up the chair, climb onto the counter, then tiptoe on the counter to try and grab them off the top of the GIANT yellow fridge. But besides that, nothing. My Grandmom on the other hand, always had some kind of junk food laying around, and even better, I, along with my cousins, were allowed to eat whatever we wanted. I was allowed to make my own sandwiches. I could stare into the fridge for like 20 minutes and not get yelled at. Her cream cheese was always moldy, but she always had cool stuff to eat. Down the basement next to a little closet and an old wooden workbench that had a cool old red vice where I liked to squeeze stuff like crayons and action figures, Grandmom had one of those old fridges form the 50’s with a long latch handle. It was always full of little boxes of Yoohoo (the first time I had ever seen such a thing) and little cans of V-8 and other assorted small sized beverages. In the back of her cellar was a shelf with bags of assorted pretzels and Doritos. It was the only place I had ever seen Doritos. Little bags of chips weren’t really popular in lunches back in the very early 80’s, people still stuck them in sandwich bags from a larger bag. I didn’t go food shopping with my parents very often either. Philly wasn’t wired for cable until 1985, so I wasn’t inundated with ads for crap food all the time either. So, once I had them (after asking and hearing the “Nicky, eat whatever you want!” yelled down the steps), it was love. I still love Doritos. Sometimes, even with YooHoo. Are Doritos my Madeline? Nah. But the old school bag does remind me of being really little and finding something new. Oh yeah, and loving it! Posted on January 7, 2011, in junk food and tagged cheese flavored tortilla chips, doritos, junk food, old logos, tortilla chips. Bookmark the permalink. Leave a comment.